Pápai Páriz Ferenc, Album amicorum p. 189. Debrecini. Anno 1711. 19. Augusti. * 2Cor 3,5: Vulgate: “sed sufficientia nostra ex Deo est”. Tamás Veresegyházi, doctor of medicine, and at this time first pastor of the church of Debrecen. In Debrecen, on August 19, 1711. Tamás Veresegyházi was born in Debrecen in 1643. He learned in his native town, from 1665 also the higher studies, until he became a senior. In the meantime he was a rector in Bihar. From 1672 he went to visit foreign universities. After Frankfurt an der Oder, Leipzig, Marburg and Zürich in January 1674 he went to Basel where he graduated in theology. He also visited Breslau (Wrocław), and taught for a year in Debrecen. As a pastor, he served in Nagykároly (Carei), Biharpüspöki (Episcopia Bihor), Bihar, Hajdúszoboszló, and from 1686 Debrecen. In 1711 he was elected Bishop. He died in Debrecen in March 1716. Besides his greeting and funeral poems, his works are: Disputationis theologicae … pars prior, de praedestinatione Dei et electione sanctorum … Veres-Egyhazi author & respondens. 2 tom. Zürich, 1673. – Defensio inauguralis thesium theologicarum de providentia Dei. Zürich, 1674. From the end of 1709 Tamás Veresegyházi spent a year and a half as a pastor without a community, and he just received a new place in August 1711. 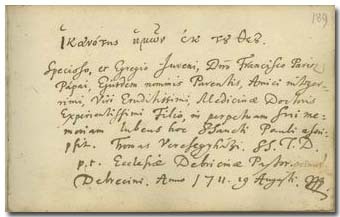 He wrote in the album in August 19, 1711, this is why he signs it as "at this time" (pro tempore) first pastor of Debrecen. He was elected Bishop on September 20 of the same year.